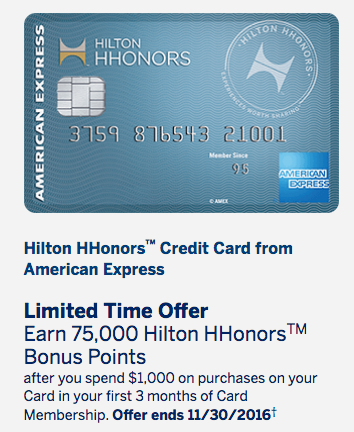 The American Express Hilton HHonors Credit Card now has an increased sign-up bonus of 75,000 Hilton points when you spend $1,000 within the first 3 months. Similar to the offer that just came out on the Amex Hilton Surpass Card it is marketed as a limited time set to expire on 11/30/2016. The standard offer available on this card is 50,000 bonus points, so with the increased offer you’re getting an extra 25,000 Hilton points. Plus the spending requirement is relatively low on this card which makes it easier to meet for many. Bonus: 75,000 points after spending $1,000 in the first 3 months. -- 7X points per dollar spent at Hilton properties. -- 5x points per dollar spent at U.S. restaurants, U.S. gas stations, and U.S. supermarkets. -- 3x points per dollar spent on everything else. -- Free Hilton Silver status comes with the card. -- Earn HHonors Gold status through the end of the next calendar year when you spend $20,000 on your card in a calendar year. Quick review: The 75,000 point sign-up bonus is a nice bonus offer with a low spending requirement, and given that the card does not have an annual fee is it a great card to keep. Note: Remember that you are only eligible to earn the sign-up bonus once per lifetime on a specific American Express card product. This means that if you’ve had this same card before you may not be eligible to earn the bonus. The American Express Hilton HHonors Credit Card is now offering a 75,000 Hilton points sign-up bonus after spending $1,000 within the first three months. This increased offer has been out before in the past, but it’s the highest bonus ever offers which makes it a good time to apply for the card since you can only earn Amex bonuses once per lifetime. The card does not have an annual fee and makes a great card to keep open year-after-year to increase your average credit account age. Apart from the sizable sign-up bonus the card offers limited perks in my opinion, but earning the bonus alone and the fact that there is no annual fee makes it worth signing up. Will Amex match this offer for people who were recently approved for this card offering 50,000 HHonors points for $750 spend? Tim, there are mixed reports of people successfully (or unsuccessfully) getting Amex to match a higher offer. The best route is to call in and ask to speak to a supervisor, then once you get them on the line request for an offer match. Hope it works out!